Thank you for your interest in White Flower Farm. 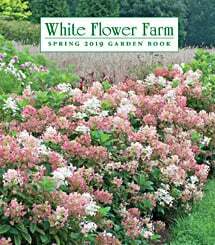 Please sign up below for a copy of our Spring 2019 catalog. It should be arriving to you in 2 to 3 weeks. Sorry, we cannot send catalogs or orders outside the lower 48 states. Yes, I'd like to receive occasional email offers and web specials from White Flower Farm. Yes, I'd like to receive occasional catalogs from carefully screened, garden-related companies.